Glass/Mirror Services | Auto Tint | Mirrors | Valparaiso,IN | Trout Glass & Mirror Inc. It was Thanksgiving dinner, 1977, and brothers Jeff Trout and Mike Trout held a conversation that would forever changes their lives. They found out a glass company in Hobart was up for sale and talked about buying it and starting their own business. Mike Trout says he wasn’t happy with his current job anyway, so he figured he would enjoy the change. And so, with a $10,000 loan from a local bank, they bought the business for $6,000 and used the remaining money for operating costs, opening their doors for business on February 1, 1978. “We knew it was already an established business with a listing in the yellow pages,” says Mike, who adds that the stability of an existing, turn key business was helpful in getting their start. 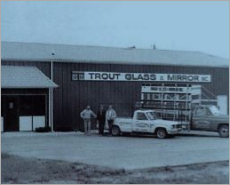 The Trout brothers were familiar with glass business because their father, Charlie Trout, had worked at the glazing trade while they were growing up. His experience and knowledge, which included a time as local union president, helped to get the boys started and was valuable to the early success of the business. “In the three years we were in Hobart, we had two buildings built and moved because we outgrew them,” says Jeff. So the Trout brothers set their sights on what they really wanted –to move to Chesterton and set up shop here in Duneland. In 1980 they moved to a building in Chesterton, the same building that currently houses Trout Glass and Mirror Inc., at 1579 S. Calumet. “At the time, the Rte. 49 bypass only went as far south as the Toll Road, but we knew that someday it would become the I-65 of Porter County. The building wasn’t even within the Chesterton town boundaries in those days. This was unincorporated Porter County then. But we felt Chesterton had growth potential because there was no glass company here,” says Jeff. It was because of the potential for growth in Duneland that the Trout’s say their choice in establishing a business here was important. And their theory worked. 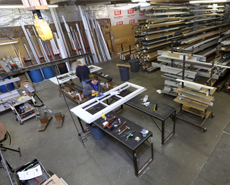 Their business grew to supply largely commercial businesses with glass and mirror, as well as residential entities. “We do a lot of business in Northwest Indiana and Porter County. 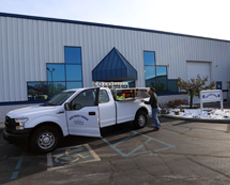 Chester Construction is one of our largest clients in Porter County. 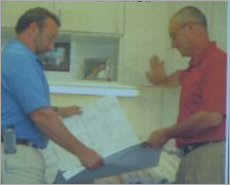 Anybody who is a general contractor, we’ve worked with them,” says Jeff. 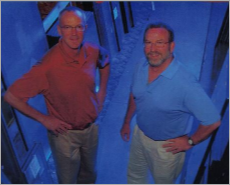 “We started from nobody and now we’re a premier glass company,” Mike says. They estimate about 80% of their business is commercial and 20% is residential. Much of their commercial business is to local contractors, as well as large buildings in Chicago and all over the greater Chicagoland area. “We did the new Harris Bank in Chesterton, and completed ones in Crown Point, Merrillville, and Bolingbrook, Ill. The CVS in Chesterton is another local job; we’ve done a number of Walgreen’s all over Northwest Indiana; about 50 Aldi Food Stores in the past several years; we installed 280 shower doors for the New Springhill Inn at River North in Chicago; and we completed ¾ inch tempered glass sinks for a new condo building at 353 N. Wacker in Chicago,” says Jeff. “We’ve done work in Flint, Mich. and Springfield, Ill. –we get around,” Mike says. Jeff adds, “People get a broken window, they call us.” The only type of glass the company doesn’t work with is auto glass and stained glass. Trout Glass and Mirror’s products include glass furniture tops, all types of flat glass replacement, patio door replacement, and windows, tub and shower enclosures, beveled vanity mirrors, mirrored walls, framed mirrors, glass etching, window tinting, broken or failed insulated glass, and they provide services at clients homes or in their shop. Today the company boasts some 40 employees, some of which have worked for Trout Glass and Mirror for more than 25 years. The Trout’s have also been very dedicated members of the community, availing themselves to charitable work, as well as civic work. Jeff served as a member of the Chesterton Town Council, has been on the Chesterton Board of Zoning Appeals for “a dozen years,” a member of the Chesterton Plan Commission, and was a past president of the Kiwanis. Mike is a 26-year member of the Duneland School Board, has served with the Boy Scouts of America, is a past board member of the local YMCA, coached numerous youth sports, and is a 37 year member of Rotary Club. “We’ve sunk our roots pretty deep here in Duneland.” says Mike.